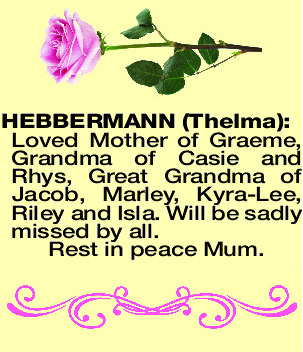 In loving memory of our dear mother, grandmother and great grandmother. You will be sadly missed from our lives. Be at peace knowing you were loved by all of your family. Carol and Les, Graeme, Kerry and Dave, Nolleen. Grandies - Carla, Darren, Ben, Emma, Casie, Rhys and Jess. 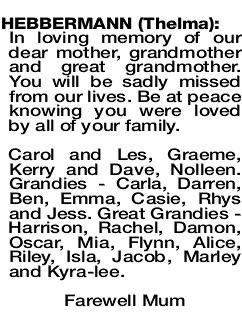 Great Grandies - Harrison, Rachel, Damon, Oscar, Mia, Flynn, Alice, Riley, Isla, Jacob, Marley and Kyra-lee. 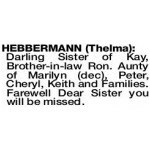 The Funeral Service for the Late Mrs Thelma Hebbermann of Narembeen is appointed to be held at the Anglican Church, Thomas Street, Narembeen, TUESDAY (9.4.2019) at 11.00am followed by a Private Cremation. 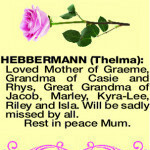 HEBBERMANN THELMA Loved Mother of Graeme, Grandma of Casie and Rhys, Great Grandma of Jacob, Marley, Kyra-Lee, Riley and Isla. Will be sadly missed by all. Darling Sister of Kay, Brother-in-law Ron. Aunty of Marilyn (dec), Peter, Cheryl, Keith and Families. Farewell Dear Sister you will be missed. 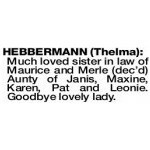 HEBBERMANN THELMA Much loved sister in law of Maurice and Merle (dec'd) Aunty of Janis, Maxine, Karen, Pat and Leonie. Goodbye lovely lady.